As mentioned in the above, Schon classified the three models o dissemination: “the center-periphery model”, and two variations of it: the “proliferation of center model” and the shifting centers model”. The essence of the simple Center-periphery approach is that it assumes that the process of dissemination must be centrally controlled and managed, that the innovation is planned in detail prior to its dissemination and that the process of that dissemination is one way-from the center out to the consumers on the periphery. (i). the innovation to be diffused exist, fully realized in its essential, prior to its diffusion. (ii). Diffusion is the movement of an innovation from the center out to its users. (iii). 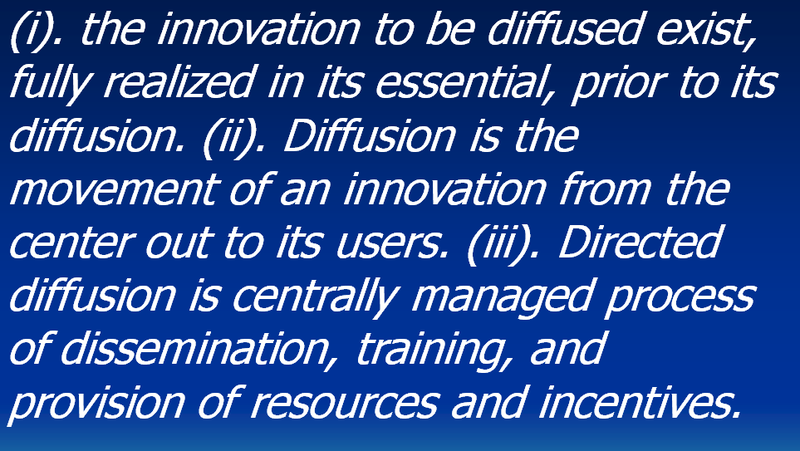 Directed diffusion is centrally managed process of dissemination, training, and provision of resources and incentives. The scope of center periphery model varies directly with the level of technology governing the flow of men, materials, money and information, the scope of center-periphery model depends on its capacity for generating and managing feedback. Because the process of diffusion is regulated by the center, its effectiveness depends upon the way in which information flows back to the center. When center-periphery system exceeds the resources or the energy at the center, overloads the capacity of the radii, or mishandles feedback from the periphery, it fails. Failure takes the form of simple ineffectiveness in diffusion, distortion of the message, or disintegration of the system as a whole. On the other hands, Ratnavadivel (1995:71) states, it has to be borne in mind that Schon’s models were not based on innovation or changes in the field of education curriculum. However, it has been applied an interpreted in the context of reforms, innovations and changes in the field of education. Two examples model in British context are provided by the Nuffield-Sponsored Resources for Learning Project and the Schools Council’s Sixth from the general studies project. 2) The Proliferation of Centres Model. The principal problem of design shift from the design of product or technique to the design of a network and the pattern of social learning shift from successive ‘sweeps’ of limited innovations from a center throughout a periphery, to the formation of self-transforming network. (Schon 1973:108). Secondly, as Donald and Walker (1976) have expressed, the demands on center management, particularly the center doctrine, may not meet the needs of secondary center leaders looking for support and flexibility to counter local resistance, and such centers may become detached from the primary center. Thirdly, the lack of identification with an innovation may lead to an absence of feeling of ownership and thereby commitment toward the innovation.